New to Southern Belle! Planning to take a vacation to Tybee Island? If so, you have probably noticed the large amount of available Tybee vacation homes in the area and are wondering where to start. Southern Belle makes your choice easier with a great selection of vacation rentals Tybee to fit any big or small vacation party. 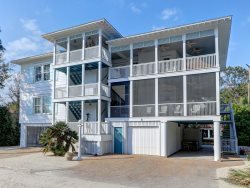 Once you have selected the perfect Tybee Island vacation house, you can get on with planning all the other aspects of your vacation. One of our great Tybee vacation homes is the Movie House Lot B property. This excellent two bedroom Tybee island vacation house sits right across from the Atlantic Ocean and the gorgeous Tybee beach. The only thing you will be thinking about here is enjoying ocean views and basking in the warm sunshine on the beach. This vacation rentals Tybee property sleeps four people in two bedrooms with one bathroom. It includes great amenities like cable television, Internet access and easy beach access. Enter the main living area for the Movie House Lot B property and find large-style tile flooring in a classic dark and light pattern, along with a comfortable leather sofa. It's nicely backed up to the kitchen so you can enjoy a social atmosphere while cooking or dining. There's also two ceiling fans to keep things cool during your stay. Outside on the deck you'll find plenty of room and a fantastic view of the ocean. Pull up a chair and sit outside to enjoy the ocean breeze in the evening. Relaxing in your comfortable accommodations or taking a quick stroll to the beach will probably be near the top of your list when you arrive, but make sure to venture out and see what else Tybee has to offer. Near the Movie House Lot B property are a few great places to snack or eat a meal. The Sugar Shack and Sundae Cafe are some of the most popular places on the island. Another popular restaurant is the Tybee Island Crab Shack, which offers great seafood and famous margaritas. You can explore Tybee Island on foot with a guided beach walk, or check out the saltwater marshes with a marsh trek. Tybee Bike Tours offers cycle tours and Sundial Charters offers a variety of water tours, such as dolphin watching. One of the most popular destinations is the Tybee Lighthouse. There is also a museum nearby the 270 year old lighthouse. Staying on Tybee Island for its great views and beach access is definitely recommended, but if you have some extra time, you won't want to miss venturing into nearby Savannah as well. There's even more great food and culture in historic downtown Savannah, as well as a number of museums and historical landmarks. An always popular destination is Forsyth Park with that well-known iron fountain. You can also take a trolley or horse-drawn carriage tour to see the best of Savannah in less time. Start your Tybee Island vacation right with Southern Belle's Tybee vacation homes. Don't waste all the time you could be planning fun activities by looking at a bunch of vacation rentals Tybee. Instead, rent a great Tybee island vacation house from Southern Belle and don't look back. I love coming home to see family, friends, and spending time at the beach. We loved being right across from the beach as well as down the road from the Sugar Shack! Love the ease of the beach access, property could use some minor sprucing up but overall a great place. Everyone was friendly and helpful! They helped me find the perfect location for our stay and that made our honeymoon even better! Movie House Lot B is perfect for a small family of 2-4. It's in an ideal location! We were walking distance to several great restaurants and more importantly we had direct beach access across the street! We loved this property and have already looked into booking the entire house for next year! The staff member I dealt with was most friendly and helpful. A pleasure...Danny maybe? from New Zealand. Great lad. I enjoyed staying at this property...well worth the value. I loved the self check in. We had a great time. The property is perfect for four people. Access to the beach can't be beat.